Few artists inhabit their music as seamlessly as multiple award-winning, Billboard Top 10 ranked guitarist and composer Lawson Rollins. He plays his instrument with a soulful intensity that combines the stimulating rhythmic drive of rumba, salsa, and samba with graceful melodic finesse and free-flowing improvisational flair. Acoustic Guitar Magazine describes his playing as 'impeccable' and 'dazzling', while the prestigious Guitar Player Magazine ranks Lawson as one of the “50 Transcendent Acoustic Guitarists” of all time and writes, "Lawson Rollins is a bona fide star...The key to Rollins' mass appeal is his signature artistic balance between classically influenced compositional refinement, infectious exotic rhythms, and the unbridled intensity of full-on shred." Over the past 20 years, Lawson’s albums have landed in the Billboard Top 10 World Music Chart and spawned several Billboard Top 30 contemporary jazz hits, winning him a growing fan base attracted by his melodic, exhilarating solos and exotic, cross-genre instrumentation performed by internationally renowned musicians. Sensational videos like "Locomotion," a jaw dropping display of his electrifying speed and gift for merging rhythm and melody, have attracted millions of broadcast television and internet viewers, including 10 million hits alone on YouTube from multiple postings of his videos by avid fans worldwide. Lawson's critically acclaimed, award-winning, genre defying solo albums - INFINITA, ESPIRITO, ELEVATION, FULL CIRCLE, TRAVELER, INFINITE CHILL, 3 MINUTES TO MIDNIGHT, AIRWAVES: THE GREATEST HITS, and DARK MATTER: MUSIC FOR FILM - landed high on the contemporary jazz radio charts and produced a Billboard #1 song - "Moonlight Samba" from ESPIRITO. For two consecutive years, he earned a 1st Place award in the prestigious USA Songwriting Competition. He also won three Gold Medals in the Global Music Awards for Instrumentalist, Album, and Top 10 Albums of the Year for his TRAVELER album. As a testament to his enduring appeal on radio he was asked to serve as "Celebrity Guest DJ" on Sirius-XM Radio, available to listen to here. His albums feature numerous collaborations with artists from around the globe, including Grammy Award winners and nominees like Big Bad Voodoo Daddy, Charlie Bisharat (of Shadowfax), Airto Moreira, Flora Purim, Mads Tolling, Kayhan Kalhor (of the Silk Road Ensemble) and Horacio Hernandez, as well as Billboard #1 charting contemporary jazz masters like 3rd Force and Praful. An ever growing cast of eclectic, notable artists continues to expand his world-fusion sound, with musicians such as Idan Raichel, Buckethead, William Aura (of 3rd Force), and Shahin Shahida (of Shahin & Sepehr) contributing to the mix. In his globally-inspired music, Lawson incorporates the propulsive drive of Afro-Cuban rhythms with a style based on the music of Spain, India, Persia and the Arab world. "All music has a hybrid quality," Lawson believes. "Thousands of years of travel, trade and communication between cultures created new forms of musical expression. The Spanish guitar embodies this with its ties to the Arab oud, the Persian tar, even the sitar, so weaving those strands together seems natural to me." Lawson picked up the classical guitar at age 15 after hearing the recordings of Spanish guitar legend Andres Segovia. Though he began his studies in the classical genre, he quickly developed his own style, a combination of salsa, Latin jazz, blues, samba, bossa nova, and classical music. "While obsessively studying classical guitar in my teens, I discovered Latin jazz through some of Charlie Parker and Dizzy Gillespie's Latin infused collaborations. Stan Getz and Gerry Mulligan led me to bossa nova; Miles Davis' Concierto de Aranjuez opened my eyes to Spanish tinged improvisation. Duke Ellington's world-jazz album The Far East Suite was also a revelation that led me away from purely classical guitar music and towards a world music fusion sound in my compositions." Lawson's genre-blending playing was marked by a distinctively sparkling technical proficiency, grounded in an uncommonly dexterous classical finger style approach. After graduating with an English degree from Duke University and earning a graduate degree from the London School of Economics, Lawson moved to Washington, D.C. and formed the genre-busting Latin fusion group Young & Rollins with guitarist Daniel Young. Their hit debut album SALSA FLAMENCA immediately landed on the Billboard Top 25 Chart for its genre in the year 2000. They toured the world, performing at major music festivals and venues like the Sydney Opera House, and made three more records - SEVILLA (2001), ESPERANZA (2005) and MOSAIC (2006) - before Rollins left the group to explore new musical horizons. He moved to San Francisco and created his first solo effort, INFINITA, an album that touched on all the music he was interested in. It added Arab, Caribbean, Persian, classical North Indian and other world music colors to the mix. "I envisioned a multi-instrumental, kaleidoscopic sound that would give me a chance to explore a diverse array of musical styles from around the globe, far beyond the salsa-rumba fusion that was primary to the Young & Rollins palette of sound." Lawson’s debut 2008 solo album INFINITA was made with the production assistance of Shahin Shahida of the Persian-American duo Shahin & Sepehr and platinum producer/pianist Dominic Camardella (Ottmar Liebert, 3rd Force, Flora Purim). It included an impressive cast, featuring Azerbaijani kamancheh virtuoso Imamyar Hassanov; Afghani vocalist Humayun Khan; Grammy winning violin player Charlie Bisharat; bassist Randy Tico; Persian percussion master Pejman Hadadi; drummer Dave Bryant; iconic Brazilian singer Flora Purim; and legendary percussionist Airto Moreira. The album was released in 2008 to universal rave reviews and placed three singles - the Brazilian flavored "Cafe jobim," "In Motion" and the title track - on major jazz and radio airplay charts including the Billboard Top 30. Lawson's goal for the album was to create a globally inpired, cross-genre sound that would give the other players plenty of freedom. The recording amply matched his vision. ESPIRITO (2010) expanded the geographical and musical range of Lawson's debut. The album was composed as a suite, with thirteen interlocking compositions that ranged freely through the folkloric roots of world music. Its wide-ranging palette spanned continents and cultures without ever losing its bedrock groove or playful sense of adventure. Lawson reassembled many of the players from the INFINITA sessions, including Shahida, Camardella, Purim, Airto, Bryant, Bisharat and Tico. He added Iranian kamancheh master Kayhan Kalhor, Cuban drummer Horacio Hernandez, Moroccan ghanoon player Hicham El Anmari, trumpeter Jeff Elliot, cellist Cameron Stone and vocalist Diana Booker from the world/jazz/hip-hop group Eyedentity, who was featured on the Billboard #1 radio hit "Moonlight Samba." It was recorded at Skywalker Sound, the state of the art Marin county studio owned by George Lucas and Santa Barbara Sound Design, Camardella's studio. It showcased a wider spectrum of sound, rich with Lawson's guitar overtones and a warm bed of ambient sound. ELEVATION (2011) marked an expressive high point for Lawson, as both a composer and performer, breaking new ground with an eclectic cast of musicians. Always in search of unique sounds and new collaborators, Lawson enlisted producer Shahin Shahida to record some of the top Persian musicians on location in Iran, while associate producer William Aura took recording equipment to Kathmandu to capture Nepali flute master Ruben Kumar Shrestha and other Nepalese players. The performances were edited into the sessions Lawson recorded with the rest of his collaborators at Santa Barbara Sound Design. Once again, Lawson confounded expectations by enlisting avant-garde electric guitar legend Buckethead to add some rock flourishes to the Latin/Indian waltz "Slow Ascent" and the Afro-Cuban pulse of "Ghosts of Alcazar." Other guest artists on the album include Iranian santur virtuoso Pejman Eckhtiari, sitarist Nasir Syed and, most unlikely, the pedal steel guitar of Jim Hoke, featured on the Billboard Top 30 radio hit "Daybreak.". Like ESPIRITO, the record unfolds more like a symphony than a collection of songs, ebbing and flowing through soundscapes that are alternately dense and expansive, touching on free jazz, world music and Lawson's indefinable melodic sense. FULL CIRCLE (2013) entered the Top 10 of the Billboard World Music Chart shortly after its release. The song "Shifting Seasons" earned a 1st Place Award in the USA Songwriting Competition and brought Lawson the further honor of placing 3rd in the Overall Best Artist Category, a first for an instrumentalist in the award's 20 year history. The album lives up to its title, with 12 tightly focused tracks that bring Lawson's guitar work up front. The stripped down sound is produced by a small band of long time associates: producer and keyboard player Dominic Camardella; Grammy winning violinist Charlie Bisharat; bassist Randy Tico; percussionist Dave Bryant; cellist Cameron Stone and saxophonist/flutist Richard Hardy. The album is also the first to feature Lawson's work on electric guitar, keyboards and drum programming and offers insight into his creative process, which usually begins alone in the studio with a multi-track device to capture his initial inspiration. "My goal is always a piece that can stand alone as guitar music," Lawson says, "with melodies and rhythms that invite other players to share in the passion of the moment. FULL CIRCLE is a return to my roots in a sense; the sound that is centered and grounded in the instrument I know best - the nylon string Spanish guitar." TRAVELER (2015) hit the Top 20 iTunes World Music Chart in the first week of its release and spawned the America's Music Chart radio hit "Berlin Bossa." "Traveler" won 1st Place in the USA Songwriting Competition and also three Gold Medals in theGlobal Music Awards for Instrumentalist, Album, and Top 10 Albums of the Year. The album takes listeners on a global musical journey. Bridging countries, cultures, and continents, the music features Lawson's distinctive guitar-work backed by an eclectic, all-star ensemble. The expansive arc of the album reaches from the traditions of the Old World to the pulse of the modern metropolis with a boldly diverse, genre-defying mix of melody, rhythm, and improvisation. Featuring 2 time Grammy winner Mads Tolling, Big Bad Voodoo Daddy members Scotty Morris, Joshua Levy and Karl Hunter, Grammy winner Charlie Bisharat, and platinum-selling producer Dominic Camardella. INFINITE CHILL (THE REMIX SESSIONS) (2015) - Lawson's first remix collection, featuring 10 classic world music hits taken from his solo albums, remixed and reimagined with a modern aesthetic, incorporating elements of electronica/chill-out/down-tempo into the world music fusion of the original songs. Featuring new guitar performances from Lawson, remixing from Billboard chart ranked Persian-American musician/producer Shahin Shahida, and an all-star cast of musicians including legendary Brazilian chanteuse Flora Purim. The track "Cafe Paris (chill remix)" was the #1 most added song at contemporary jazz radio in its debut week, while the album as a whole was ranked as the #18 most played album of the year in 2016 by the SmoothJazz.com radio chart monitor. The album also hit the CMJ Radio Chart and achieved #1 on the Amazon.com Hot New Release charts. 3 MINUTES TO MIDNIGHT (2017) - 12 original songs that capture the urgency of the moment, the exhilaration of the speed of sound, and the poignancy of the remains of the day. Featuring the Billboard Top 30 and MediaBase Chart radio hit "Island Time". The album reached the Top 20 iTunes World Music chart and the Top 10 Amazon Hot New Release chart. Guitar Player Magazine writes: "The classically trained maestro, renowned for seamlessly blending various Latin styles...incorporates new plucking techniques to play aptly timed flourishes at supersonic speeds that will make your head spin." Full Interview here. AIRWAVES: THE GREATEST HITS (2018) - An 18 track collection of Lawson's Billboard Top 30 radio favorites from over the past decade, plus 2 new tracks featuring Grammy winner Mads Tolling and Billboard #1 charting band 3rd Force. 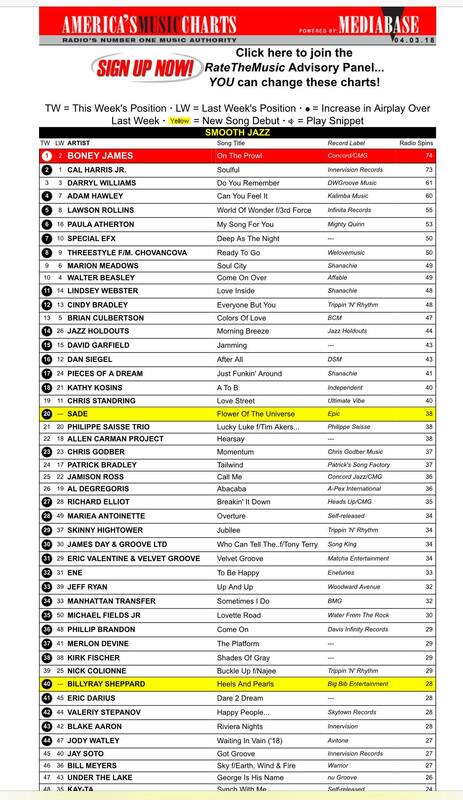 Featuring the brand new song "World of Wonder (featuring 3rd Force)", a Billboard top 10 radio chart smash hit. Also Top 5 on the major America's Music Chart. DARK MATTER: MUSIC FOR FILM (2019) marks a bold departure for Lawson as he sets aside his main instrument - the nylon string Spanish guitar - and crafts a mysterious soundscape of lush steel string acoustic and electric guitars, synthesizers, violins, and flute that transcends conventional song structure in favor of free-form musical impressionism ripe with emotional intensity. The atmospheric instrumental music is designed to engender cinematic imaginings in the mind's eye of the Listener. Supporting Lawson's electric, acoustic and slide guitars are Grammy winning violinist Mads Tolling, acclaimed multi- instrumentalist Stephen Duros, and Native American flute master Guillermo Martinez. 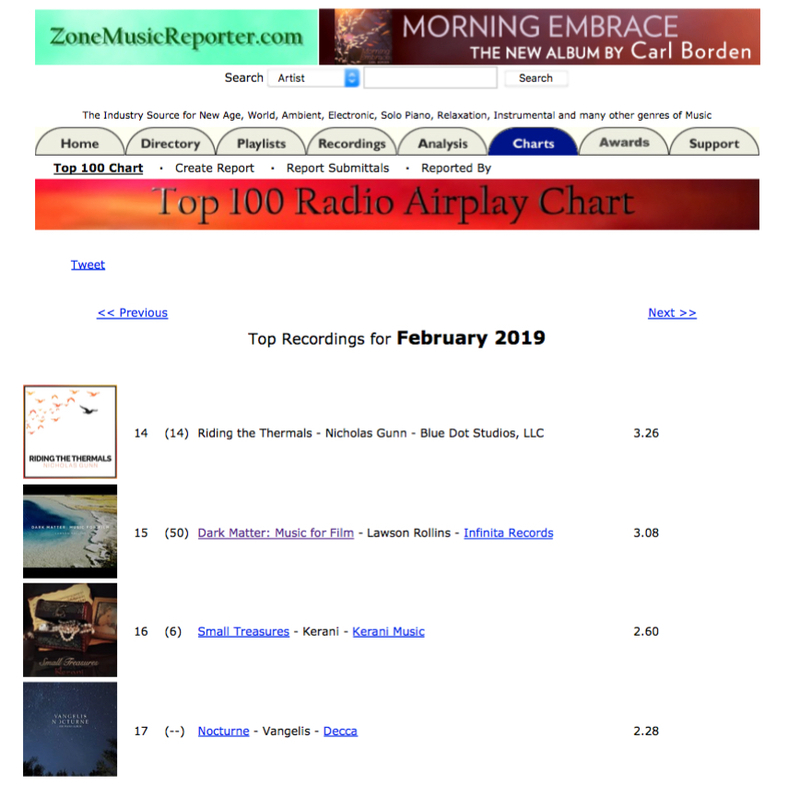 Multiple tracks from the album has garnered radio play on stations around the world, including Sirius-XM radio and Echoes/NPR, landing the album in the top 15 on the ZoneMusicReporter top 100 radio charts. VIDEOS showcasing Lawson's unique finger-style technique and prodigious command of the guitar have gone viral on the internet and attracted millions of viewers, a rare feat for an instrumental artist. "The videos were meant to be eye catching and entertaining to watch, but I thought they'd be of interest mostly to fans of highly technical guitar playing," says Lawson. "I never planned to put these short, improvisational pieces on an album; I just wanted to convey the feeling of one small certain aspect of my playing. I hope viewers of the 90 second 'Fire Cadenza' or 2 minute 'Santa Ana Wind' videos will move from the videos to something more complex and melodic from one of my actual albums, like the 7 minute track "The Diamond Path" from the Elevation album, which has flavors or India mixed with Afro Cuban rumba and showcases an eclectic cast of musicians from Nepal to California." Enjoy a free download of "The Diamond Path" here. Not surprisingly, the videos struck a chord with viewers from around the world, both guitarists and non-guitarists alike. Guitar World Magazine aptly states: "It's not often that a Latin jazz guitarist generates millions of views on YouTube with short instrumental pieces, but Lawson Rollins is used to defying expectations."